We regulate “public drinking water systems” (systems that serve 15 connections or serve 25 people for at least 60 days per year). We implement a source protection program involving drinking water source watersheds. We review and approve plans and specifications for construction of facilities for public water systems. We provide financial assistance to public water systems for the purpose of building infrastructure. We also work cooperatively with other funding agencies in this effort. 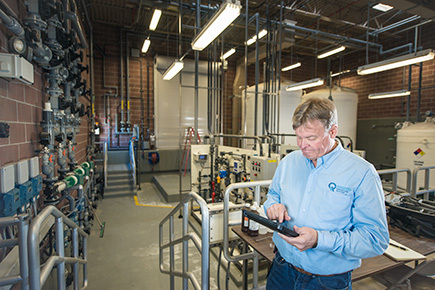 We train and certify water system operators, and we track continuing education of operators. We monitor the effectiveness of water treatment plants. We implement the EPA rules relating to drinking water quality, monitoring, and treatment. We implement a cross connection control program to ensure that harmful substances do not backflow into drinking water distribution systems. We certify water utility personnel indicating that they’re qualified to run a cross connection program for their utility. We certify backflow technicians indicating that they’re qualified to test backflow equipment. We certify trainers indicating that they’re qualified to train on cross connection programs and train backflow technicians. We provide training to consultants and water utility people on all aspects of the Division’s programs. We initiate enforcement actions when technical and financial assistance are ineffective in ensuring a safe and reliable supply of drinking water. We implement a water system rating program which measures compliance with the Division’s rules. We direct water utilities to investigate customer complaints relating to quality or supply. Depending on the findings and reports, the Division may also participate in the investigation. We respond, in cooperation with the utility, to emergencies and we provide training, guidance, and encouragement to utilities on preparing vulnerability assessments and emergency response plans. We witness well grout procedures on wells intended to be used as public drinking water sources. We perform all administrative tasks and associated functions to enable us to accomplish the above identified tasks. We don’t collect water samples. We don’t regulate single home water systems. We don’t provide water connection services or engage in construction activities. We don’t compel water utilities to turn an individual customer’s water back on after the utility has shut off the supply for non-payment of water bills. We don’t compel individuals to connect to a public drinking water system.